« Fairie Chick’s Fantasy Book Reader Reviews God Johnson! Thanks so much Ellen, and I’m definitely going to try to catch Richard at one of his gigs, maybe at Burlington Vortex Conference? I agree with John, Linda you are a gem. Hope to hear you speak again–most interesting. I was impressed by your research on your Whitewater book, “The Poison Widow” and how you broke the local story which went national on the beast of Bray Road. Any public events scheduled? In response to this post, it reminded me of what Richard Thieme is saying in the great book he contributed to along with some other awesome researchers. Their focus was on the U.S. Government’s response to UFO’s [“UFOs and Government: A Historical Inquiry”]. Just like you say about monster sightings, witnesses reporting UFO sightings are denigrated and joked about, but these researchers have solid evidence from Freedom of Information Act research that can’t be denied. Richard is giving a series of lectures at public libraries around southeastern Wisconsin and Crystal Lake, IL in October 2013. He’s a great public speaker with degrees from Northwestern University and University of Chicago (checkout youtube, wikipedia) and very credible. Now me, I thoroughly enjoyed this book and LOVED the cover !!!!!! GREAT painting. 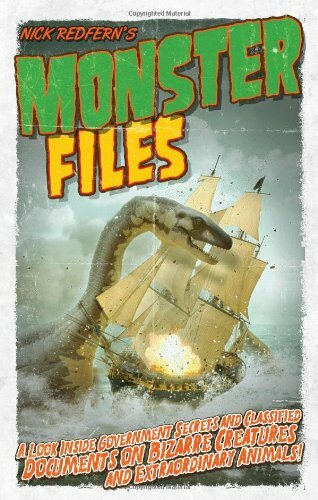 Only thing technically wrong with it is that the sea monster is TOO enormous !!!!! It is many times the size of the biggest oceanic serpent ever reported! But, hey !!!! Exaggeration is half the FUN !!!! !